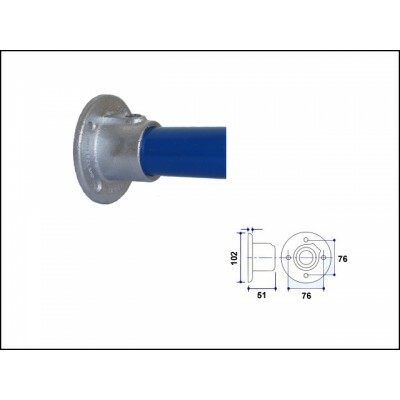 Positional fixing wall flange that is typically used where rails meet walls on level sites. Warning: This Interclamp fitting is not recommended as a baseplate to support guardrailing, handrailing, parapets, balustrades or other similar structures. Please use the Railing Base Flange (JWICL132) as an alternative when a baseplate is required. Dimensions in images are millimetres. Warning: This clamp fitting is not recommended as a base plate to support handrailing, guard railing, parapets, balustrade or other structures.